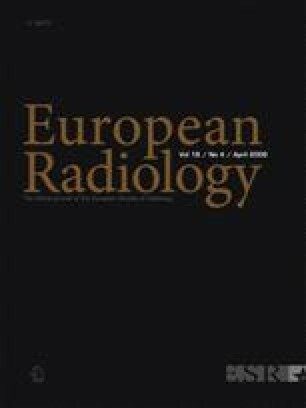 The purpose was to evaluate the accuracy of multidetector CT angiography (MD-CTA) in the morphologic assessment of peripheral arterial occlusive disease (PAOD) compared to digital subtraction angiography (DSA). Fifty consecutive patients referred for DSA of the peripheral arteries due to PAOD were prospectively included in this study and underwent 16-row MD-CTA prior to DSA. Maximum intensity projections and multipath curved planar reformations were created with a semi-automated toolbox. Twenty-one vascular segments were defined in each leg and compared to DSA findings with regard to gradation, length, and number of lesions. Mean sensitivity and specificity in the detection of significant stenoses (over 70%) were 100% and 99.5% in the iliac arteries, 97.4% and 99.0% in the femoro-popliteal arteries, and 98.3% and 99.8% in the infrapopliteal arteries, respectively. High kappa values for exact stenoses gradation (0.74–1), lesion length (0.74–1), and number of lesions (0.71–1) were reached by MD-CTA, indicating high agreement with DSA. Non-invasive MD-CTA is an accurate tool for the assessment of all treatment-relevant morphologic information of PAOD (gradation, length, and number of stenoses) compared to DSA. This work was supported by Fonds zur Förderung der wissenschaftlichen Forschung (FWF, Austria) under the contract no. L291–N04.